Kenneth Hite is the author of over 50 books, and one of the biggest Cthulhu fans working in roleplaying games. Through Pelgrane Press, he's been working on horror titles like Trail of Cthulhu and vampire vs spies conspiracy thriller Night's Black Agents, a game which has seen its latest supplement, The Dracula Dossier, hit Kickstarter a few days ago. It's enjoyed great success, exceeding its target within a matter of hours. 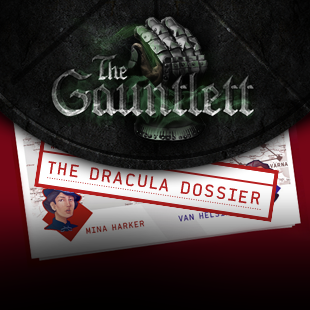 I sat down and talked with Ken about the Dossier, and what those unlucky enough to face off against the most dangerous vampire in history can expect. Adam Gauntlett: Which three words best describe Kenneth Hite? Kenneth Hite: Let's see ... Writer, Dilettante, but what would be the third one? Lunatic? Occultist is a good one, though it has connotations of belief that I do not share. Fortean, I think might be excellent! Gauntlett: You've been in the writing business since the 1990s, full time since 1996. If you could get into a time machine right now and tell yourself one thing about your career that your 1990s self really needs to know, what would it be? Hite: So far my career is doing well enough that I don't have too many missed paths. It might be 'go to more computer game conferences' and 'get more computer game writing gigs,' since those pay an order of magnitude more than tabletop games, by and large! Hite: In addition to Trail of Cthulhu and Night's Black Agents, I do Ken Writes About Stuff, that's every month. I do around eleven pages worth of new material, and some of those are GUMSHOE, looking in on specific subjects like martial arts, voodoo, there's one on Goetia coming up. Some of them take on discretionary topics like the Nazi Bell project, and some are campaign frames, like Moon Dust Men about alien crash site investigators in the 1970s, or The School of Night, occultists, poets and spies in the 1590s. But the majority, the preponderance of them are what I call the Hideous Creatures series, where I look at any individual monster from the Lovecraft mythos, trying to understand as many different angles, so you have a bunch of different things to do with, say, Deep Ones. That means your players will never go, 'oh look, wow, Deep Ones, we've never faced them before.' The whole point of Lovecraft's monsters was that they were original, so people wouldn't go 'wow, werewolves, never seen that before.' It's my attempt to bring some of that uncertainty back that Lovecraft put in. Gauntlett: What attracts you to GUMSHOE, as a system? Hite: First of all, I'm attracted to it because it's the system that Simon hired me to do my own Cthulhu in, so I'd love it for that alone! But it so happens to be a very, very elegant way to run and play a game. If you're a trad gamer but you're closer, maybe, to the narrative or story end of things, and less the tactical side ... for example, when I play GURPS the system, I never use all the bells and whistles in it, because I'm attracted to the elegance of that 3d6 bell curve and being able to apply it across a broad variety of situations, and the GUMSHOE system has that same level of elegant simplicity. Except we haven't spent twenty five years adding to it! So you can still see the elegance at its core. It also suits my style of play, where I provide all kinds of scenery and detail, clues and things that stick out of the sides, and I think that if you read the stuff that I write you can get an idea for the kinds of things that I play, because I write the games I want to play. Gauntlett: Once upon a time you told an interviewer that you were working on 'a "vampire spy thriller" GUMSHOE game that needs a good title.' Well, now it's got one, Night's Black Agents, a quote from Macbeth. What persuaded you to use that sweet title? Hite: I picked it because of the Macbeth connection - I'm a big Shakespeare fan, as I think pretty much every literate English speaker should be - and I liked the ambiguity of the quote. It talks about the crows and other damned agents that are going to come out and do Macbeth's bidding, but spies are literally black agents, in the sense that they do actions under the cover of night or outside the view of society. I liked that the Night's Black Agent could be a vampire bat, or a spy who's hunting vampires. Also, it's a title of a Fritz Leiber anthology, and I've been a Leiber fan since forever, so it was a nice little way to tip my hat to him, on the QT. I mean, he invented the urban fantasy genre, which is, in a sense, what Night's Black Agents is part of. I wanted to give him the shout-out!